When VW Group took over the reins at Bentley Motors and launched the Continental GT, it proved to be an immediate success, with over 26,000 units sold worldwide. In fact, the Continental’s sales figure account for over 33% of the brand’s total sales. With an all-new Continental model launched in 2010, Bentley also took the opportunity to introduce a more efficient engine – a V8 as an alternative to the W12. In 2011, the Continental GTC made its debut and then in 2012, the GT Speed was introduced to the world. It might not look it, but the Continental GT Speed is Bentley’s sporty, top of the range model, and with a top speed of 330km/h, also makes it the fastest street-legal production Bentley to-date. Motivation comes from Bentley’s familiar W12 engine which has been paired with two turbos and is mated to a ZF-sourced eight speed gearbox. The GT Speed is 60:40 rear-biased and power figures are massive: 625PS and 800Nm, with peak torque from as low as 2,000rpm. These figures closely rival the previous generation 630PS/800Nm Continental Supersports. As you might expect, performance figures are eye-watering – zerotohundred sprint in 4.2 seconds from a car that tips the scales at 2.3 tons. A Porsche 991 C2S weighs almost 0.9 tons less and has a similar sprint time as the GT Speed. My previous experience in a sporting Bentley was late last year when I drove the V8 version of the Continental GTC (you can read the article here). Although dynamically impressive, the V8 GTC felt a little underwhelming and I felt the car could do with more power. The GT Speed fixes this predicament by method of significant power hike, and I was raring to find out exactly how the W12 would perform. In fact, I was keen to find out just how the GT Speed would stack up against two other grand tourers we’d driven before: Aston’s Rapide and Porsche’s Panamera. I eased my way out from the Bentley showroom in the heart of KL, away from the hustle and bustle of the city and headed for clearer, more familiar roads. As soon as traffic eased, I gunned the throttle and the GT Speed responded in kind – surging forward with absolute totality and zero drama. In my head, I had some trouble trying to comprehend how cars this huge, and heavy, could move so damn quickly. As you might expect, gearshifts are super smooth and if I did not have one eye on the speedometer, I would not have felt that we’d so effortlessly passed 200km/h. Despite having eight ratios, the GT Speed’s new gearbox is able to drop from 8th all the way to 3rd – a useful feature in over-taking scenarios. More impressive perhaps, was how the GT Speed dealt with its gargantuan weight. Bentley claims the new car has shed off some 35kg, but when you factor in its 2,350kg kerb-weight, seems rather insignificant. Clearly, this car is as big as it is heavy, but we drove through some tight, two-lane roads and were thoroughly impressed with the car’s composure. The cabin seems to shrink around the driver at speed, making it easy to place the car. At speed, the depth of its talents also begin to show – with little traffic on our test route, we were surprised at how agile, and quick, the GT Speed was through corners. The car’s steering is well weighted; light when cruising and weightier at speed, with good feedback. It’s accurate too, and responds quickly to driver inputs. The GT Speed’s suspension has been reworked too – stiffer springs, increased damping force, and lowered by 10mm over the regular car. Of course, no Continental GT will ever be the nimblest of cars; you can clearly feel its heft through corners. But the amount of available grip and the way it holds on to the road, and intended line, is pretty amazing. Under normal circumstances, the GT Speed munches highway miles with little effort, but flick a switch to engage Sport mode, drive the car hard, and the enthusiast driver will be well rewarded. Another of the car’s strong – and we mean very strong – points are its brakes. Our test car came fitted with standard steel options, with carbon ceramic stoppers remaining optional. There is some travel on the pedals before you feel the biting point, but the GT Speed manages to shrug off inertia quickly and reassuringly. We punished the car numerous times on our test strip – something we know most owners would never subject their cars to, and yet the brakes showed little to no signs of fade. Pace and grace aside, the GT Speed continues to impress in other departments; it was conceived as a luxury grand tourer after all, so comfort and luxury should come as standard. Unlike previous Bentleys we’ve driven before, our test car had dry carbonfibre trim which replaced traditional wood veneer – a very nice option which will appeal to younger enthusiasts no doubt. 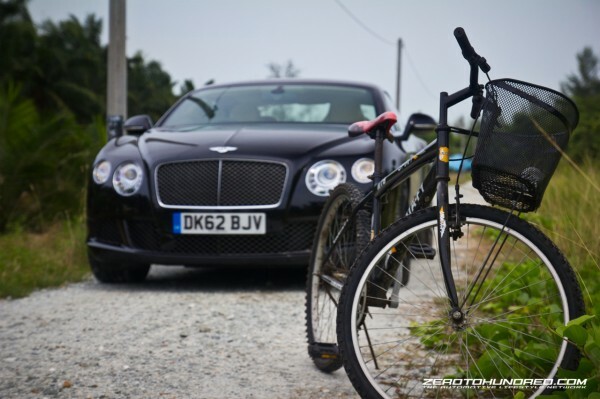 The GT Speed, like all other Bentleys, oozes class and showcases British craftsmanship. There are some quirks of course – a light sheen of condensation on the air-conditioning aluminum shrouds – a little unsightly perhaps, but also unfortunately unavoidable in our humid, tropical climate. Oh, and the lever controls behind the steering wheel seemed to be placed a little too far away; we know there’s plenty of loads of cabin space, but my hand can only reach so far! But GT Speed’s flaws, especially on the interior are few, with the ones that we discovered, miniscule in nature. 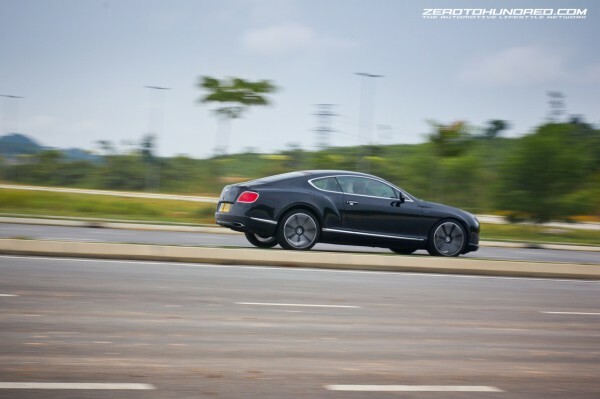 So how does the Bentley Continental GT Speed stack up against a Panamera or Rapide? Well, it loses out to the Porsche in the dynamics department, but only just, and gets piped by the Aston’s shrieking V12 in the aural department. But of the three, the GT Speed is the most well-rounded grand tourer here. It looks the best, is likely to get the most attention at valets, and will seat four persons most comfortably. It’s the most luxurious one as well, the cabin a good mix of aluminum, wood and leather, with a total of ten hides making up the exquisite interior. When we set off for our test drive with the Bentley Continental GT Speed, we had no idea it would be such an engaging machine. I’m a big power guy, and the GT Speed is a tool with sledgehammer-like performance. But I soon discovered that it was very competent around corners as well; you can drive it hard like you would a sports car, but fill up the seats and it will tootle along in the most gentlemanly manner. It’s well-engineered, refined, and mixes classic British luxury with poise and brute force. All this comes at a price of course, but if money was no object, I know just how I’d configure mine.